As crisper weather sets in, nothing beats the rich aromas and tastes of organic winter squash from local partners Featherstone Farm and Wisconsin Growers Cooperative. Unlike their summer counterparts, which are picked immaturely for the best taste, winter squash is harvested when fully grown, ensuring robust flavors. Hundreds of winter squash varieties exist, including common favorites like butternut, acorn, and spaghetti. The following varieties are available at the co-op throughout fall, winter squash’s peak harvest season. Enjoy them steamed, baked, boiled, roasted, stuffed, or mashed. Winter squash goes great in hardy autumnal soups or eaten on its own. An instantly recognizable fall classic, butternut squash has a deep orange colored flesh with a distinctive butterscotch flavor and is best eaten when steamed or baked. Acorn-like in shape, this squash has orange colored flesh with a nutty flavor. This variety is perfect for stuffing and best when baked. Named for its spaghetti-like strands of golden flesh, this variety is an excellent substitute for pasta noodles. Best when baked, shredded, and topped with your favorite marinara sauce. Delicata squash has a unique taste and smell reminiscent of butternut squash, corn, and sweet potatoes. The creamy yellow flesh is best eaten when steamed or baked. This squash has distinguishing variegated patterns of orange and green markings on its exterior. Its orange flesh has a slightly nutty, buttery, sweet flavor. Best eaten when steamed or boiled and mashed. The Hubbard squash has a dry, orange flesh with a firm texture that tastes sweet and nutty. It can be used as a substitute in recipes that call for pumpkin or sweet potatoes. Best eaten when baked, roasted, or steamed. Kabocha squash has a deep green exterior and bright mustard-colored flesh with a sweet, rich taste. 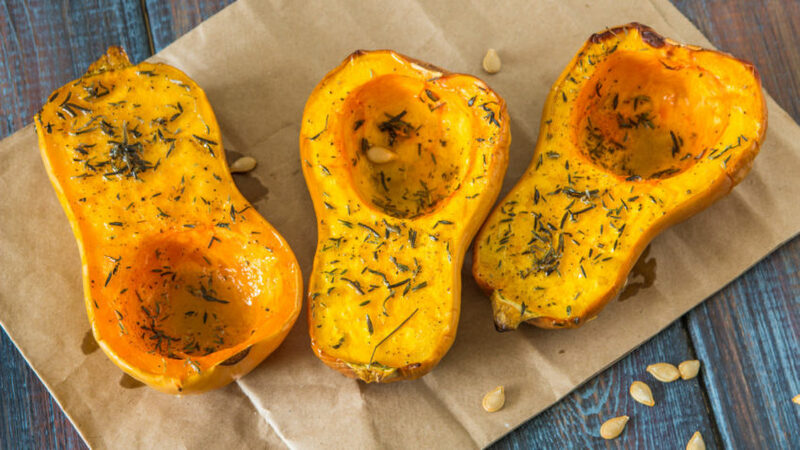 It has the highest sugar content of any winter squash and is excellent baked and stuffed. Bright orange and pear-dropped in shape, the red kuri squash has a very rich, sweet flavor with a bit of spiciness to it. Excellent baked whole or split. While much different in size and appearance than butternut squash, buttercup has a similar creamy, orange colored flesh with a slightly less-rich taste. Great baked, and pairs well with apples and brown sugar.